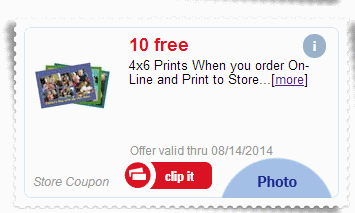 Meijer: 10 FREE 4x6 Photo Prints! You are here: Home / FREEbies / Meijer: 10 FREE 4×6 Photo Prints! Meijer: 10 FREE 4×6 Photo Prints! Where are my Meijer shoppers?? We have a nice FREEbie for you this morning! Login to your mPerks account and click on “Photo Center” on the left-hand side. Once there, you will see a coupon for 10 FREE 4×6 photo prints when you order on-line and print to store. Clip it, and then upload and order your prints. Pick them up the next time you shop. It’s that easy!